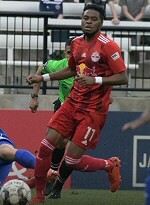 New York Red Bulls II continued their winning ways with two goals in the span of three minutes making the difference away to Charlotte. It was the hosts who were off the mark first, with Andrew Gutman skipping to the byline following a one-two pass and delivering a low, driven ball to the near post. Niki Jackson got a flick on and beat Red Bulls II goalkeeper Evan Louro. Eight minutes later, New York struck back with forward Marcus Epps sending in an inch-perfect pass to the head of Tom Barlow, who looped an effort over Charlotte's Brandon Miller and in. Three minutes later, New York capitalized on more momentum their way and found an eventual winner. Midfielder Jared Stroud picked out Barlow in the center of the box, where he would convert past Miller for his second of the night. Charlotte would create a few more chances as the game wore on, but Louro was equal to every effort to help preserve three points for his side.